For me the best part of India is always the food. Easily with the best in the world and the one thing which keeps me itching to get back. However my obsession with Indian food begins long before I set foot in India itself. It began in Southeast Asia a region where Indian cultures thrive. 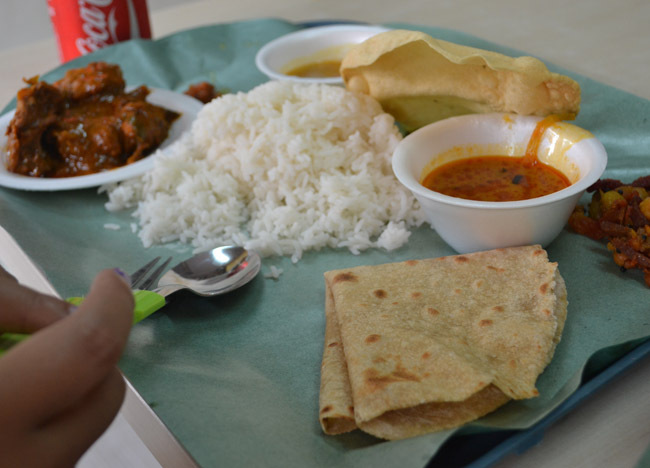 Foods following the spice routes through Sri Lanka, to the Malay port of Penang, through the Straits of Malacca and onto Singapore. Southeast Asia boasts some delicious, authentic and cheap Indian food. Foods unlike the bizarre interpretations I first found in the UK. This post is more of an introduction to eating in India. Aimed to explain Indian food, ingredients and cooking, to the best I can. This in truth is far from easy. India is big, terminology differs, recipes change. While some areas cook in a Kadai others use a Karahi. Here is my guide to eating in India. Flatbreads could easily fill their own post so I will keep it simple with Roti and similar flatbreads. Roti is a simple pan fried (griddled) flour flatbread popular throughout India and Southeast Asia. The word Roti literally translates as ‘bread’ in Sanskrit and it is the basis of many other flatbreads. Next up is Paratha not so different to Roti only thickened with layers and often stuffed with a centre. My personal favourite is Puri a deep fried Roti which for a flatbread is more puffy than flat. Last up is the chapati, again similar to Roti only this time thinner. Flatbreads are a staple of Indian eating and accompany almost every meal. This popular Indian side dish is a common staple food through most of the South Asian subcontinent, from the Southern points of Sri Lanka to the highest peaks of the Himalayas (our Himalayan food guide). To me a tad bland at times but with added spice and heat of chillies and Dal can quickly become the perfect side dish. Expect Dal for breakfast. Tandoori is the term for foods cooked in the Tandoor – a giant earthenware oven. It is the secret behind many of this world’s tastiest chicken, the two common favourites, Tandoori Chicken and Chicken Tikka. In cooking the chicken is first speared by giant skewers before being smoked to perfection within the Tandoor. Result, crisp on the outside tender on the inside. With Chicken Tikka and Tandoori chicken the main difference between the two is the preparation. Chicken Tikka consists of boneless chicken pieces while Tandoori Chicken can be any (or all) of the chicken including bone. The marinades also differ Chicken Tikka generally coated for short times in yogurt and spices while Tandoori Chicken is marinated overnight in spices. Naan bread is another popular flatbread which is cooked to crisp on the insides of the Tandoor. After chicken in India the meat of choice is Mutton. Why? Pork is forbidden under Islam (Halal) and Beef forbidden under Hindu (Holy Cows). In India sheep are happily eaten by both. Cooked proper (slow) mutton is tender, delicious and rich in flavour. I find it strange to find so little in the west. In western restaurants lamb the younger sheep is preferred. You will find both Mutton and Chicken on almost every non-veg menu in India. I’ll have the Mutton. Satisfying, filling and delicious. For me Paneer is the perfect meat substitute and with added curries and spices it is the one reason why vegetarianism is possible (but very unlikely). It is also a very simple cheese to make. Full fat cow milk, separate the curd, wrap in cloth and squeeze until cheeselike. The block of Paneer cheese is then chopped to bits and added to curries and other tasty dishes. 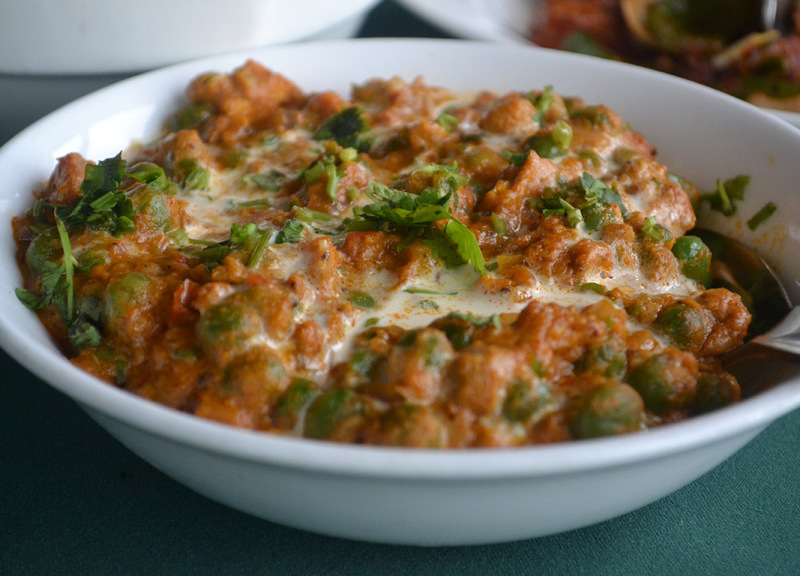 My personal favourite is Mattar Paneer where cubed Paneer is cooked with green peas in a spiced curry sauce. Amazing eating. Palak Paneer (paneer with spinach) is another favourite. The one reason why veganism is possible (but very unlikely). Potato is another staple in India’s diet with most curries and spiced dishes having the vegetarian Aloo option. It is also a common filling for Paratha flatbread (Aloo Paratha). Curry Aloo is probably the most common potato dish but the one you want is is Dum Aloo. Hard to beat. Dum Aloo is a Kashmiri favourite which has spread across the Himalayas and down through the subcontinent. Note the Aloo in Vindaloo is nothing to do with potato (I checked). Rice. The obvious staple food of India and all of Asia. A staple which I rarely take advantage when eating in India. Instead I favour extra portions of flatbreads. When I do order rice it is always the Biryani. A dish made from plain cooked rice which is mixed and layered with a spiced sauce. While often served as a meal in itself Biryani comes best matched with tandoori chicken. Again many variations of Biryani are found throughout India and South Asia. Another vegetarian favourite (sorry). In India vegetarianism (and Jainism) are commonplace which isn’t so bad. Without them we would never find these delicious alternatives. In truth with the right spices Indians can make anything taste delicious. While chickpeas are best known in Middle East cooking – in India they are done better. The common chickpea of India is the lighter Kabuli Chickpea which is best eaten in the popular Chana Masala. A second scrumptious option is the Black Chickpea (Kala Chana). Again surprisingly filling and satisfying. For many (Brits) Masala is thought to be the thick, rich curry sauce served in their Chicken Tikka Masala. While this is Masala there is a whole lot more to it. In India I find ‘Masala’ to be used more in terms of ‘dry’ dishes (no sauce). 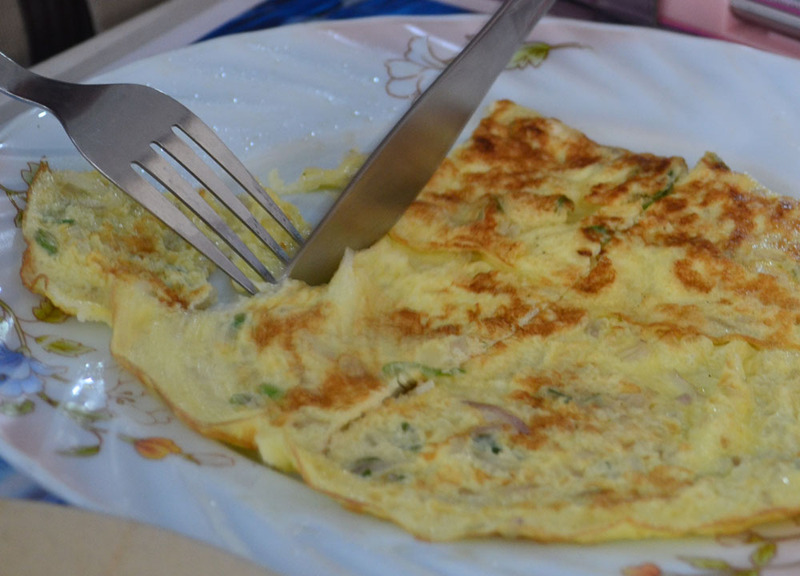 Two simple examples are Peanut Masala and the Masala Omelette (pictured below). So what exactly is Masala? The term means no more than “spice mix” and India is undoubtedly the master of mixed spices. Masala is the reason why Indian food is world renowned. Thali is the Hindi word for plate. A slightly generic term which represents a meal of various dishes. Again through India and the subcontinent this varies significantly with endless variations of dishes possible. That being said there is a good chance your Thali will include many, or even all of the above. Flatbreads, Tandoor chicken, Biryani rice and a selection of meats and veg substitutes mixed in spiced (Masala) curries. You can also expect sides of chillies, chutneys, spiced dips and more than often an extremely strong pickle (don’t scoff the pickle). Traveling to India can turn out be a lasting positive experience to someone who knows how to enjoy themselves. Eating in India can be mouth watering if you know where the best places are. Hence, take time to research the best restaurants India have. We’ll get there 🙂 Was in Kolkata for a while and ate some of the best food I’ve found. A whole new world for me to explore.